Okay, now we are going to draw another style, one that isn't as common. 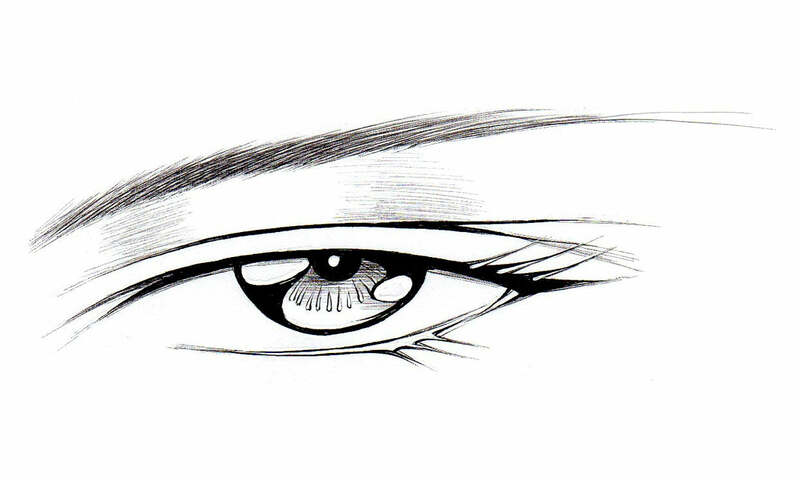 This eye is much more slender, elegant, and realistic looking, and is used in more serious anime and manga. This particular eye belongs to Deedlit from Record of Lodoss War, which is a considerably more serious show than Slayers (which is where the previous eye came from). Begin by drawing a long, slightly curved line. The left side should be lower than the right, and the line should curve in sharply at the left edge. To help you define the sides and bottom of the eye, lightly draw two diagonal guidelines that originate from the edges of the eye. Unlike the previous tutorial, these lines are not very steep; the more horizontal the lines are, the smaller the eye will be. Don't make them too flat, though, because you don't want this eye to be too squinty. Using the guidelines, draw the bottom line of the eye. Erase the guidelines and draw the outline of the iris. If there were no eyelids, the iris would be a perfect circle. However, since the iris is bordered by the eyelids, the top and bottom of the iris will be hidden from view. The iris should not be so small that you can see the entire thing (unless you wanted to convey certain emotions like anger or surprise, but that is covered in another section). Next, draw the light glares on the iris. The placement is the same as in the previous tutorial, but like the iris itself, the glares are much smaller and more circular. Draw the eyelid above the top line of the eye, as well. Draw the eyebrow and shading in the rest of the iris. Remember to draw the pupil beneath the light glares, and to make it stand out from the rest of the eye a little no matter how darkly you shade the rest of the iris. 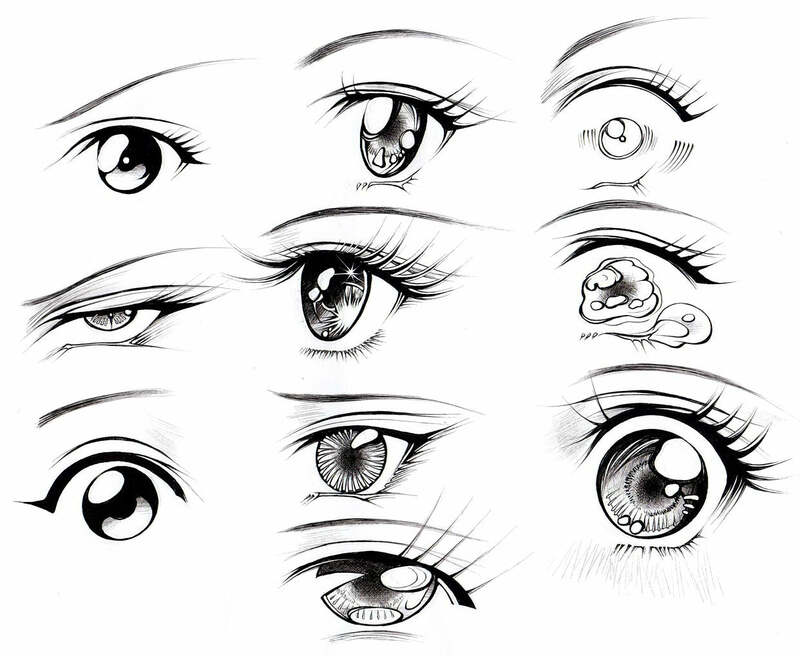 Here are a variety of other styles of female eyes you can make using the same methods. Try to see the differences between each style, as well as the similarities. Though the shape and proportions change, the top border of the eyes is always thicker, there are always multiple layers of shading on the irises, etc.